A chart summarizing our swim. 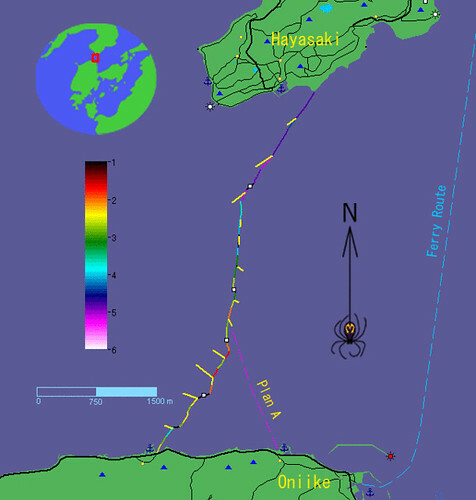 The trace of our swim is color coded according to ground speed, with the scale shown on the left. Measured currents are shown in yellow; note their variability. The small white squares are places where took short breaks to regroup and check progress. Plan A was the projected route, made suddenly impossible by an unexpected change in the current. On Sep. 20th a near cancellation of solar and lunar tidal forces caused a fairly rare phenomenon. For about two hours, this balance of forces stilled the usually violent currents in the 4.5km wide Hayasaki Strait, the body of water that separates Amakusa from Nagasaki Prefecture to the north. A similar balancing this past March 13th (it’s not an accident that both dates correspond to the quarter moons nearest the equinox) allowed a measurement of the residual currents in the straits. That standstill occurred at night, and I braved the pitch darkness and cold, as well as close brushes with no fewer than 12 large freight ships, all the while zigzagging through the straits making current measurements by kayak. These data showed, not surprisingly, that a complete standstill did not take place. Instead there were complex swirling currents of up to one knot. This is not unexpected in a place where currents exceed 8 knots at spring tides, accompanied by massive overfalls and eddies. However, with correct timing and route choice, it seemed possible to use these irregular water movements to one’s advantage during a north to south crossing. Last Thursday’s window occurred in the early afternoon hours during a blindingly bright, hot, slightly breezy day. It was time to show that swimming across the straits is indeed possible. We had actually been planning this for some time. Providing main support and making us visible to the freighters was Mr. Nozaki, an Amakusa area teacher who happens to own a small fishing boat. Mrs. Nozaki’s sharp eye was on the lookout for sinking swimmers and menacing fins (one of the latter was spotted fleetingly). 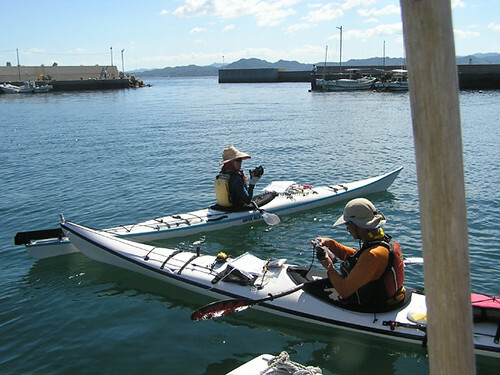 Leanne and our friend and kayaking guide Kenji Suemitsu were to be on hand with kayaks. 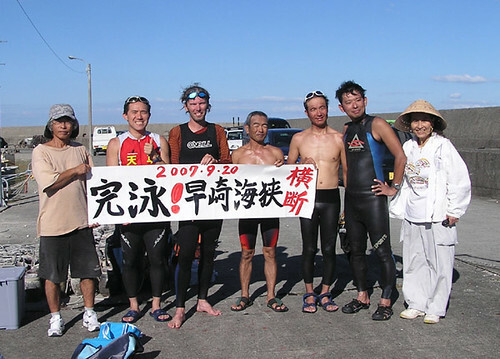 As for the swimmers themselves, a healthy bunch was gathered together by our friend Mr. Karatsu, who runs the best Ramen restaurant in Hondo and competes in triathlons, bike races, and such on his spare time. I would like to contrast here the athletic abilities of folks on either side of the Pacific Ocean. 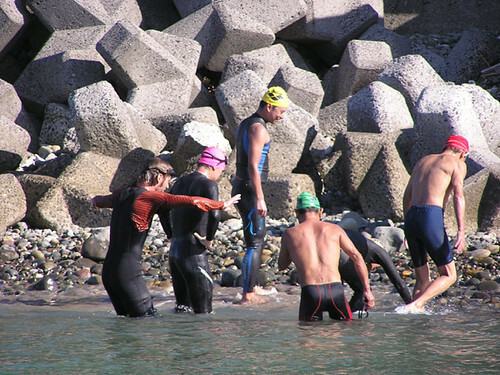 Would it be possible, in a Canadian town of 40,000 or so, to gather a group of people who’d think swimming 5km in the open sea was not a big deal? Perhaps so, but I’ll bet most would be youngsters. In Japan, on the contrary, a great many of the participants in races and competitions are over 40 years old. Sadly, young adults here are probably in the worst physical shape and health out of all the age groups, preferring comic books and video games to physical exercise as a means to self-improvement. And so it happened that I was the second youngest of the swimmers participating in the current project. Mr. Karatsu himself is 60, and the day’s fastest swimmer, Mr. Umemoto, is 70 years old. I hope I’ll still float when I am that age. 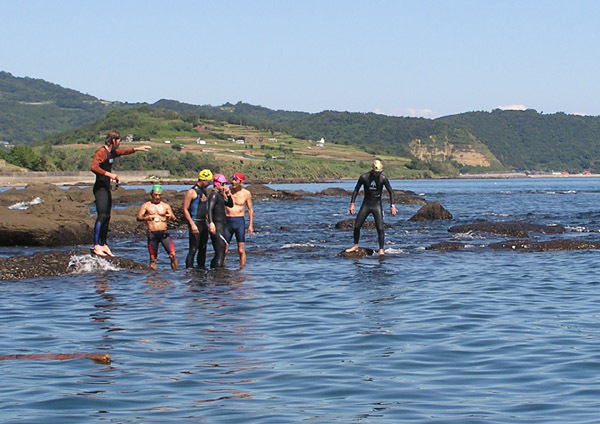 In all, six swimmers boarded Mr. Nozaki’s boat, and we were whisked over to the other side. Halfway across, Mr. Nozaki stopped the boat to let everyone appreciate what it feels like to be in the middle of the straits. This made a bit of an impression on the hitherto completely fearless bunch. Leanne had notified the local media and so we also had three TV and newspaper reporters with us, giving the project the feel of a significant event. I was however at a loss to explain to the reporters exactly why we were doing this. Because it is there? To the pragmatic Japanese, that is simply not enough. Furthermore, their take on the situation leaned toward the predictable “Wow, a gaijin! Let’s make him say he likes Japan!” That type of patting oneself on the back seems to be very important here, perhaps just to take the mind off the actual truth. The reporters themselves were perfectly nice, maybe they were even a bit tired of the routine themselves, but if this wasn't the main theme, no one would be interested. I wonder when people here will finally tire of this blindfold, cast it off and start catching up to the rest of the world on certain important issues. But anyways, I wasn’t going to think about that too much just then; there were other pressing things to attend to. We launched the two kayaks on the other side, and the six swimmers jumped overboard and climbed onto some rocks on the shore. At the appointed time, we plowed into the water and began swimming. We're off! 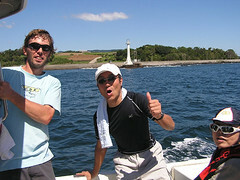 Sezume-zaki lighthouse is in the background. Rick stands out with his awesome swimming technique. With a tail current as expected, we left the shore behind rather quickly. In fact, we were moving (relative to the ground) at nearly 5km/h! During the short breaks we had planned every 800m or so, Leanne informed me of the GPS-determined current speed and direction. Everything was going according to plan. Were we really going to cross in the strait in 1h 25min as planned? Of course not. With about 1.4km to go, we were suddenly hit with a strong cross current. In my earlier research this current did happen also, but more than 40min delayed compared to our current position and time (by that time, I thought, we'd be standing on the shore). But a degree of unpredictability is always to be expected from the sea. As it was, our ground speed quickly dwindled to as little as 1.5km/h. We immediately changed to Plan B, moving our landing point about 1.6km to the west, since that is the way we were now drifting. As we changed heading, our speed once again increased to 2.5-3km/h. 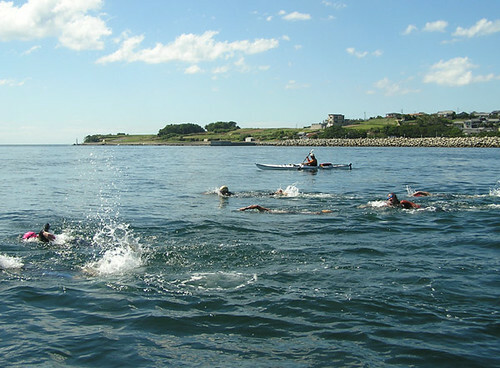 With lots of energy left, none of the swimmers were about to give up with the shore so close ahead. Not having trained for this specifically, I was the slowest of the group but by now I had found my rhythm and was beginning to really enjoy myself. Re-emerging on the Amakusa side. After two hours of swimming, it was remarkably difficult to keep balance (at least for me) standing up. Hence the arm-flapping. We made landfall about 45min late but in great shape and spirits. A small bunch of friends and onlookers met us on the shore, and it was a happy moment, if somewhat anticlimactic. It had been a bit too easy! But I knew perhaps more than anyone there that it was the sea that had given us a break. Looking at the other shore, it actually seemed more distant than usual, in spite of the crystal clear air. One gets pretty close to the sea in a kayak, but swimming is literally as close as one can get. The margin of safety is similarly reduced, even if it did not seem that way today. A commemorative moment back at the Oniike port. Much thanks to the Nozakis (framing the swimmers) for their essential boat support. 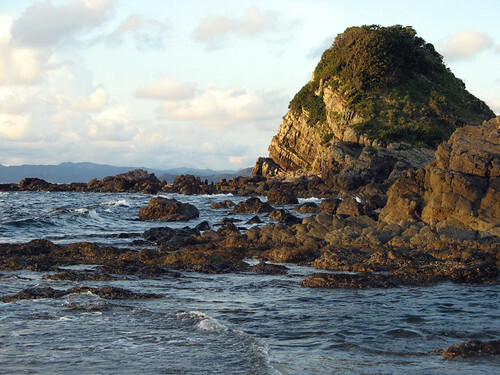 Kata-shima, in Amakusa's south-west extremity, is the archipelago's most isolated (and uninhabited) islet, lying about 5km off the Ushibuka coast. Although the main islet is barely a quarter-kilometer across, it is surrounded by numerous above and below-water rocks and shoals. Particularly remarkable and unique in Amakusa is the massive shoal system extending for about 2km to the north. Here there are virtually no rocks that break the surface: apparently two very isolated tips just poke out at spring low tides but we've never seen it happen. The shoals are teeming with wildlife and as they are completely inaccessible to from shore, they're basically virgin territory for fishing. The only trouble is anchoring the boats, donning snorkel gear while fighting the current and the waves, and the fear factor of being truly out in the open. So while we often thought about spearing here, it wasn't until today that we actualized our plans. The result was a quick windfall. 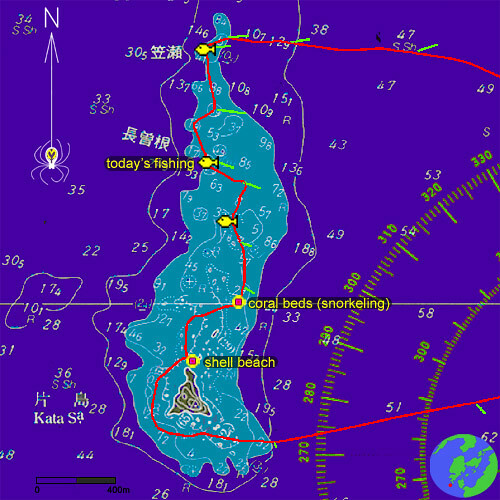 The official Japanese sea chart showing the neighborhood of Katashima. Note the extensive shoals to the north of the islet. Our most recent excursion is shown also (in red), with current measurements in green (currents are highly variable; this time they were ESE setting at up to 1 knot). The fish icon shows areas scouted to be particularly rich in large fish. A good snorkeling/diving spot is also shown, as well as where to find the nicest shells in Amakusa. The rising sun lights up Katashima first, in this distant view from Naga-shima's Mt. Gyounindake. The southernmost tips of Amakusa are seen emerging from the night's shadows; the perspective is deceiving but actually these are 5-8km closer to the camera. 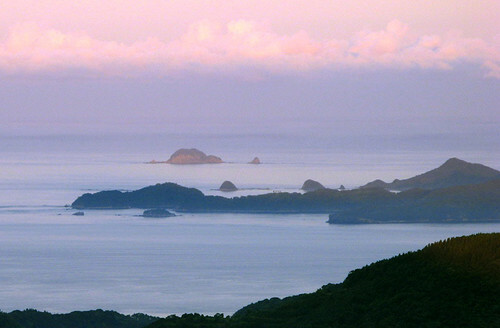 Gesu-shima, Futago-jima, Tsukino-shima, Oko-ze, and Houga-shima - kayaking, fishing, and snorkeling hot spots in their own right, are all visible. 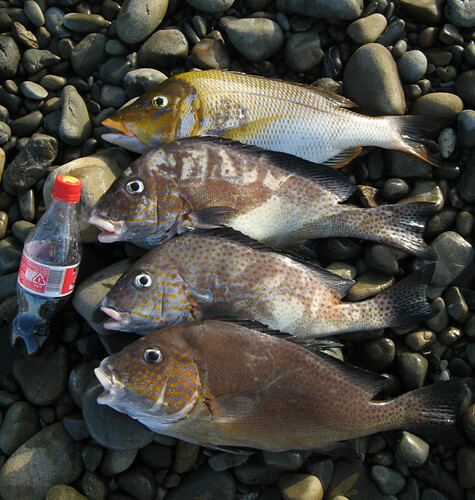 Today's catch is four fish at 1kg each, of two different kinds, both locally considered top notch in taste. Although the fish were in deep water (15-20m), they were so easy to spear that we called it quits after only 30 minutes. Plenty more are left. This is a spot not often fished, and has some of the cleanest water around (transparency was about 20m today). Probably these fish have not gorged themselves on whatever that stinky goop is the sport fishermen use for bait, so they are bound to be clean and delicious. 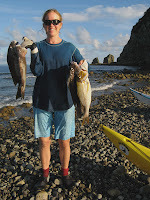 After an awkward mid-ocean, mid-current spearing session (during which the kayaks were left bobbing on the surface, tied to some table coral 6m down), we stop at the Katashima beach to clean the fish. The beautiful shoals and cliffs of Katashima. Amakusa exploring does not get any better than this. 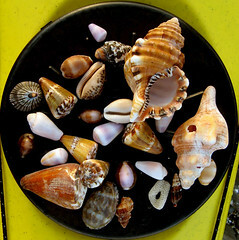 The beach, although tiny, always rewards us with beautiful shells of all kinds. Lately, more and more tropical species are in evidence, perhaps due to global warming. It is also said that the coral here is increasing (for the same reason), while in more southern locations such as Okinawa the warmer water is killing the reefs at an alarming rate. Maybe someday, we'll have bona fide coral reefs here in Amakusa! 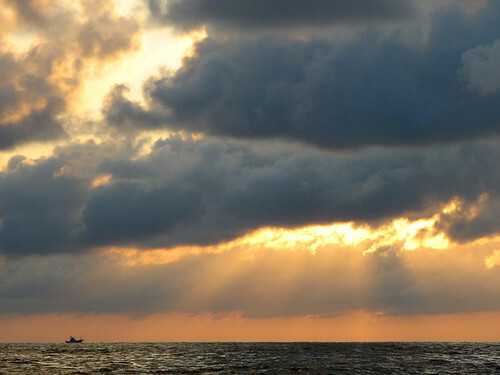 Time to be heading back as the sun sets behind the East China Sea.